The sun is free, it is ridiculous not to take advantage of it. 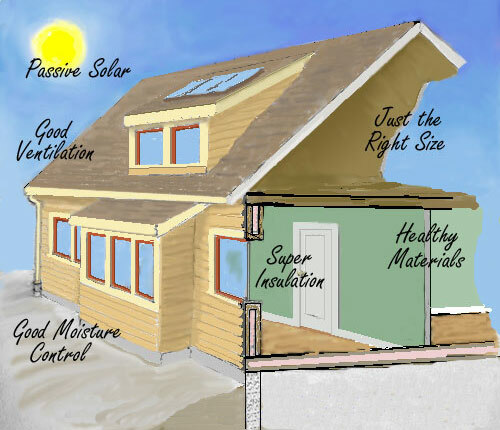 Admittedly to take maximum advantage of solar energy isn't simple yet, but taking some advantage of it is just a mater of putting windows in the right place with a proper overhang. Even in rainy Seattle, our house gets 25% of its heat from passive solar energy . The biggest obstacle to taking advantage of the sun is that developments plat out land with no thought of providing solar access, and so many homes have their sun blocked. While we believe in tight houses, we also recommend ventilation. Even a tight house will leak some air, and bath fans run regularly will increase this. Opening windows works during moderate weather. How much you need really depends on how many pollutants there are, and whether you have a moisture problem. Mechanical ventilation is best used, when you're not getting enough natural ventilation. There is no point in building space you don't use. Buildings have an enormous impact on the environment, and keeping the size reasonable is a positive thing. It also means you don't have to clean it, heat it or fix it, and the money you save can be put into a higher quality home. Keep in mind that castles are cold and drafty, and not very cozy. A house that makes you sick isn't very useful. There is a wide area between what materials are likely safe and which ones are likely unhealthy, so at some point its a matter of what risk are you willing to take, especially since many illnesses don't show up for many years. Ventilation helps, but at an energy penalty. In general, reasonable caution is probably good enough. In many climates, mold can be a big problem. The best way to prevent mold is to keep water out and keep the relative humidity from going to high. Old houses didn't have the problem because they were drafty, but this is a good solution only if energy is very cheap and you don't mind cold drafts. When its cold you, you put on a coat, you don't run in place to stay warm. Yet that's effectively what we do with our houses, because most of them have too little insulation. Building a house so it can have a lot of insulation isn't hard or expensive, and so its ridiculous that its not standard practice. Defining Green Building outlines how green building is different from conventional building.